Come Visit us at Airventure Oshkosh 2019! ﻿Thunderbird Aviation has been manufacturing and distributing airplanes since 2002. We take pride in building our planes using only the finest craftsmanship. 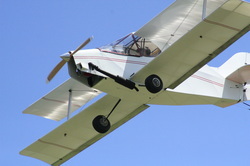 The Hiperlights were designed as a high performance aircraft using relativey low horse power. The SNS-8 only needs 28 horsepower to carry 500 pounds gross weight into the air. It also meets the requirements of Part 103 to be a legal ultralite vehicle. The SNS-9 2 place aircraft comes standard with a 65 horsepower liquid cooled engine, giving it excellent short field performance, while at the same time making it a viable cross county machine. The SNS-7 Hiperbipe is the fire breathing big brother of the SNS-9. It was designed to compete in the sport aerobatic class, while at the same time being a comfortable weekend or cross country aircraft. All three aircraft are available in a variety of packages, ranging from sub-kits to fully assembled aircraft. The SNS-7 is the fire breathing big brother version of the SNS-8 and the SNS-9. It was designed as a fully aerobatic machine, but also has the capability of carrying a pilot and a passenger cross-country in relative comfort. The SNS-8 was designed to comply with PART 103 of the FAR'S and is still one of the few Ultralight's being manufactured legally. Since it meets Ultralight Requirements, you can get in it in kit form, which is when you put it together yourself or you can get it fully assembled ready to fly. The SNS-9 is currently available in basic kit form which requires the builder to do 51% of the assembly. Soon we will be offering them fully assembled and ready to fly. It must be registered as an amateur built, requiring a pilot's license to carry passengers.